Update: These are now under the Klondike Banner, see the new review. I'm actually surprised that I managed to go six months since trying the tasty Breyers Mrs. Fields Cookie Sandwiches. As you pass these Oreo treats in the freezer aisle, you can't help but assume that they are going to be tasty...and overall, I would say they are. I was hungry, and I did go to quick, but I noticed two things. One, the ice cream itself is bland like it is in Mrs. Fields sandwiches. Two, the cookies are very dry. Not dry enough to stop me, but well, actually, I did hesitate for a moment to think about it now and then. It doesn't happen every bite, so maybe there's a technique to bite it just right. Hmmm, or maybe the ice cream in the middle needs to be a smidge thicker...funny, that's what I said about the other ones too the first time I tried them. Alright, so now that I'm warmed up, we'll see how second scoop goes...and at only 2.5g of fat, second scoop may be in about an hour! On Second Scoop: I managed to resist and waited until today (monday) for another one. 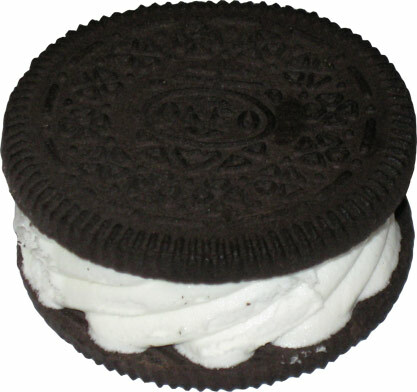 I still "like" them, but I still think the Oreo part is too dry. I think we need to shove some smooth & dreamy between the giant Oreo cookies instead of this bleach white blandness and then we'll be in business!